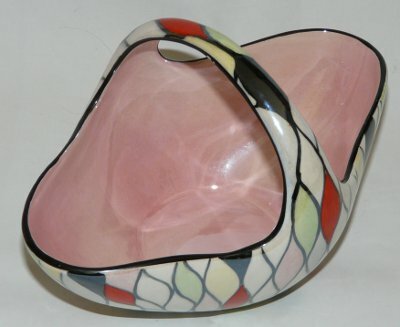 A Maling pottery basket vase decorated in Maling pattern number 6605 - the Harlequin hand traced rose pattern. This Maling basket measures approximately 12cm tall and 19 cm long. On the outside it is decorated in diamonds of white, black, red, green and rose with the inside decorated in a pearlescent lustre pink. 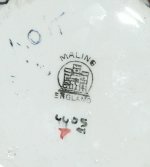 On its base this Maling basket has the black stamped MALING ENGLAND castle pottery mark, the handpainted pattern code 6605 which dates c1959, and the number 7 decorator's mark of Peggy Boustead who decorated at the Maling pottery from c1949 until 1963. Condition: Excellent overall condition with only very light overall crazing. 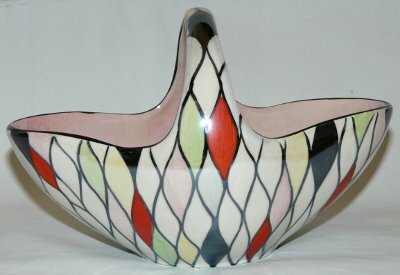 A stunning Maling basket vase.